Appropriate Measures was sited at the Irish Life Centre November 1993 as part of a group exhibition The Random Access Show. 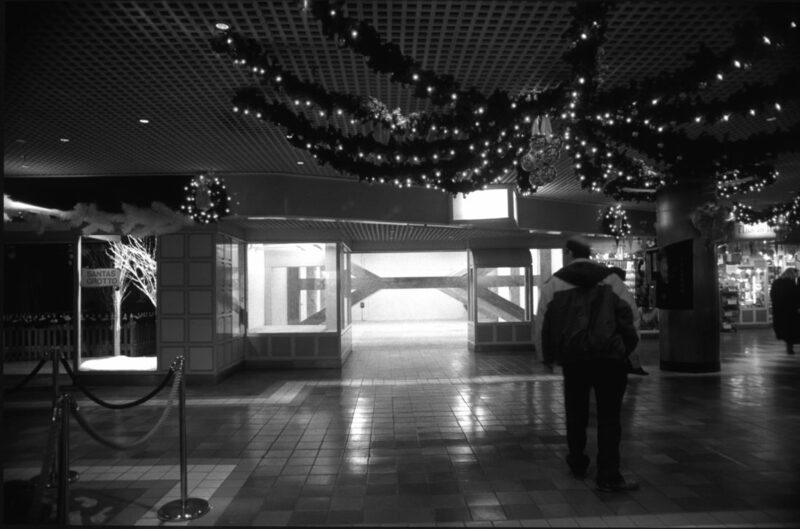 The exhibition was sited in and around the Irish Life shopping mall including a ‘gallery’ space regularly used for exhibitions. Much of the theme of the show concerned itself with the artists position vis a vie consumerism and the shopping mall. The complex as a whole is a sort of all embracing scheme of corporate headquarters, residential apartments, various offices, car park, pub, conference centre, as well as shopping facilities. The centre had several un-let retail units which were made available to the artists. Appropriate Measures, consisted of two elements, one a large scuplyure occupying an un-let shop space and the other a photographic series in the exhibition space. The first stage consisted of compiling a list of all those people responsible for the facilitation selection, administration, and accommodation of the art exhibition. The list included both those individuals actively involved in the project and those responsible by way of the respective institutions and organisations involved. The list ran to about forty individuals, including: Irish Life Assurance plc. Board of Directors, Managing Director, Arts Policy Committee, P.R.O., General Manager, the Selection Panel for the exhibition, The Random Access Committee, The Sculptors’ Society of Ireland Board of Directors, The Sculptors’ Society of Ireland Administrators. These portraits with a label stating the job or function of the sitter were presented in the form of a continuous slide show projected approximately 300 x 180 cm on the wall of the “gallery” space. The second element of the work was a sculpture consisting of three identical forms installed in an un-let retail unit. Constructed from shuttering plywood, they spanned 22 foot short side of the space. All the ‘beams’ of the buttresses’ are 12 inches square. On first impression they may call into doubt the structural stability of the building. They replicate the form of flying shores. These civil engineering structures prop the walls of neighbouring buildings after the demolition of a property in the middle. Upon inspection by the viewer the objects engineering functions are seen to be a fallacy, the beams are hollow and thin. Can the objects status as Art be deduced by the failure of the objects in engineering and utilitarian terms.